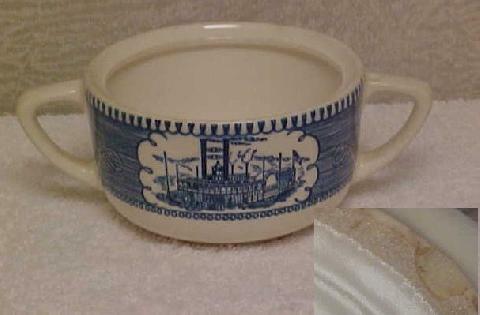 Royal China... Currier & Ives-Blue...Blue Scene Center & Scrolls, Multi-Motif...Handled Sugar Bowl NO LID! Sugar Bowl measures approximately 2 1/4" high x 4" (top) diameter. There is 1 small chip on the cery bottom (see photo). There is some crazing! In good, used condition.